When you want functional pants that stand up to the tough wear, dirt, and mess of a workday yet still look crisp and professional, these Wrangler Workwear Men's Black WP80 BK Canvas Cargo Work Pants are the perfect choice. Constructed with a tough canvas weave i ... (see full details) (see specifications) #WRGWP80BK. When you want functional pants that stand up to the tough wear, dirt, and mess of a workday yet still look crisp and professional, these Wrangler Workwear Men's Black WP80 BK Canvas Cargo Work Pants are the perfect choice. Constructed with a tough canvas weave in a 7.5-ounce blend of 60% cotton and 40% polyester, these men's work trousers are made for hard days on the job. And because keeping workwear looking good shouldn't be another full-time job, these men's bottoms are finished to retain color, release soil, and resist wrinkles. Care for them with industrial wash, light soil, or home wash them. They're built tough, too, with double-needle stitching and reinforced front pockets to help keys from causing holes. How do they fit? The rise is slightly lower than traditional work pants for a contemporary look. They feature darts above the hip pockets for a better fit. And the inseam features a gusset -- extra fabric that provides greater freedom of movement for bending, stretching, and stooping. The belt loops are longer and wider, ideal for work belts. When it comes to utility, you can't beat this design. In addition to two 13-inch slacks-style front pockets, there are two set-in hip pockets, with a button closure on the left pocket. In addition, each leg features a side cargo pocket made with a center and bottom bellows for more storage room, plus an exterior utility pocket that closes with a snap. You'll have plenty of sturdy secure spots to stow your stuff when you choose this practical pair of trousers. Offered here in black, they'll go with shirts, sweaters, and jackets of any color. 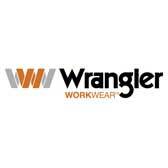 For soil-resistant, wrinkle-resistant workwear pants that are both durable and professional, buy these Wrangler Workwear Men's Black WP80 BK Canvas Cargo Work Pants from the workwear experts here at Working Person's Store. Order today! I decided to order a pair of these wrangler work pants for my job as a police officer and I am pleased with the products. They have nice size cargo pockets as well as a few little integrated pockets where I can store gear for easy access. They are durable just like my other work pants and have a good amount of play in the crotch region for running and full movement. They feel like a canvas material but are very comfortable to wear and keeps me cool in the sun, plus it has deep pockets on the sides. I have a similar pair, from Wrangler, but they are more clothey and didn't hold up well, and I'm hard on my pants, plus and best of all I can get them in a 36Wx36L, very hard to find at such a good price. Wrangler Workwear Pants: Men's Black WP80 BK Canvas Cargo Work Pants is being added to your cart.